The past few years have seen interesting trend in music. 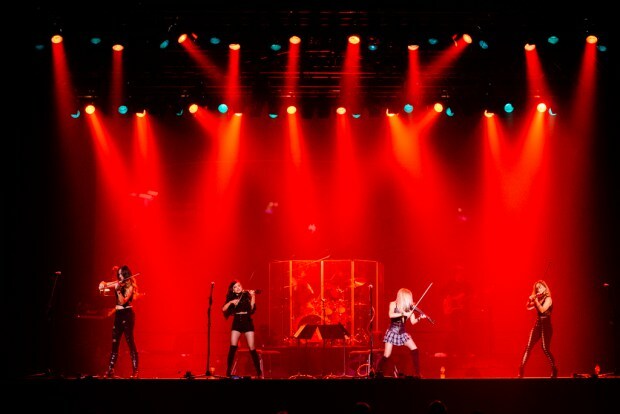 With the success of bands like Apocalyptica, Escala, and to some extent, Trans-Siberian Orchestra, hearing rock music performed on electronic violins seems to be the next big thing. Only having been founded in 2017, it’s easy to assume that Femmes of Rock have been performing as an ensemble for much, much longer. The girls perform together with a cohesion, and fluidity usually reserved only for music veterans who cut their teeth in their parents’ basements back in high school. Led by founder, Nina DiGregorio, with other violinists Christina Riegert, Chandra Meibalane, and Carissa Werner, and a backing band featuring guitar, bass, and drums, the Femmes take the audience on a 90 minute journey through the annals of classic rock, featuring hits from The Who, Pink Floyd, Queen, Led Zeppelin, and many more. Included with the music was an impressive light show, and video screen, projecting band images, and sometimes lyrics, creating a more expansive multimedia experience. The show also included audience participation, with a cowbell dance-off to…what else, Don’t Fear the Reaper, with the winner receiving a kiss from one of the girls. The winner turned out to be a plant, husband of Carissa , who flew in for the show, as it was the couple’s anniversary. (Second runner up did win a CD from the girls, so all is well). The show is filled with surprises, and the girls effortlessly transition from one song, or genre, to the next, with on occasional word from Nina, but they otherwise let the music speak for them. While Nina might be the leader of the group, each of the girls has her turn in the spotlight, playing lead on a song. And, yes, they do The Devil Went Down to Georgia, and it is incredible. With so many music options out there today, there’s something to appeal to everyone. Femmes of Rock is something that can appeal to the most casual music fan, and someone more particular about their tastes. The showroom at Ameristar, though small, did have a fairly diverse crowd. From kids under 10, to people pushing their 70’s. The show is non-stop rock from beginning to end, performed by incredibly talented musicians, who are not only classically trained, but cut their teeth by touring with many of the artists that they cover. IN short, if Femmes of Rock is coming to your area, it’s a show you’re definitely not going to want to miss.